I give. What’s a Red Skull? Am I getting too old for teh internets? Holy god. If anything, not knowing who the Red Skull is makes you too young. Dur, it’s the new design for the Warcraft Expansion Hero Death Knights! Can’t wait to roll these bad boys. Silly Dalek, learn to google. 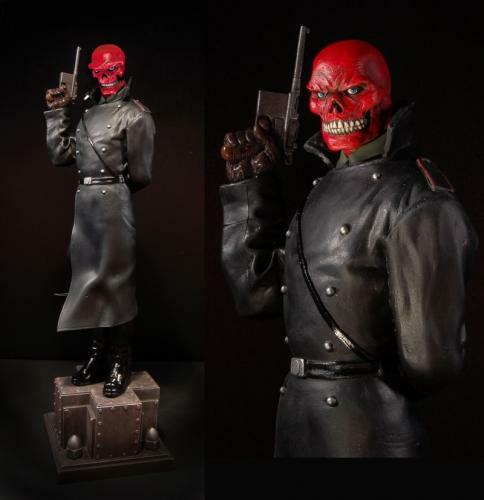 The Red Skull was such a badass, prolly the coolest enemy that Captain America had to fight, but I remember that in the cartoons he had a Russian accent … but was a Nazi … oh well. Still a badass. any villain armed with a Mauser Broomhandle is all right in my book. I had a few comics with the Red Skull in ’em, but damned if I can remember what the plot was. I think Cap was teamed up with a heroine named Diamondback (pink suit with – surprise – a black diamond on the back), and that’s about all I remember.